Jana rear-facing in the Britax Marathon at 3 years, 6 months old. Jana weighs 31 lbs and is 39 inches tall. This is Jana rear-facing at 3 years 4 months old - 31 lbs. 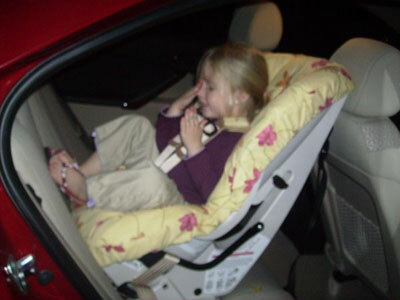 She was turned forward-facing at one, until mommy learned better and turned her back rear-facing at 3 years 4 months. She actually prefers to be rear-facing.